One of the most common questions I am asked is which vanilla should I use? 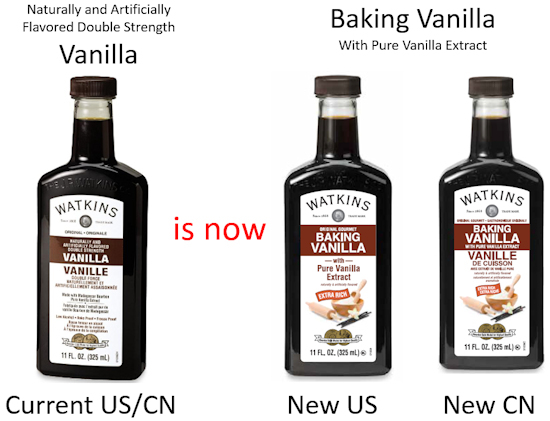 There are many vanilla extracts to choose from, Watkins has three types pure, baking and clear vanilla. I’ll help you determine the best vanilla for your needs. Here’s a handy chart explaining how to know which vanilla extract to use depending on what you are baking or recipe you are making. Below I’ll explain in more detail. When To Use Pure Vanilla Extract. For recipes that do not require high heat or freezing use pure vanilla extract, it has the highest alcohol content (35%) and some of the flavor is lost along with the alcohol when it evaporates. Some uses for pure vanilla are in icing or frosting, add it to fresh fruit, berries and fruit salad, uncooked desserts, chocolates, candies, and in cooked puddings or sauces after cooking. When used for baking cream the pure vanilla with the shortening or butter portion of the ingredients, to help prevent the flavor from volatilizing in the baking process. 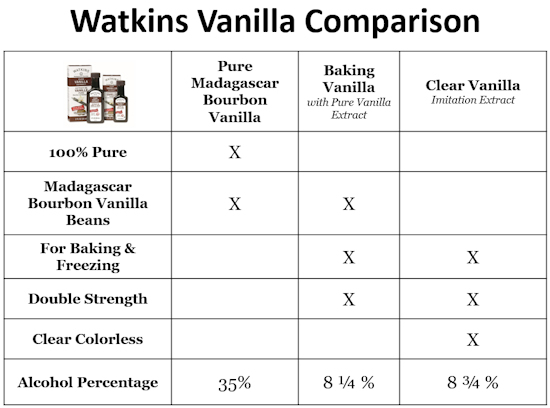 For almost all your recipes Watkins Baking Vanilla is the most versatile and your best choice. 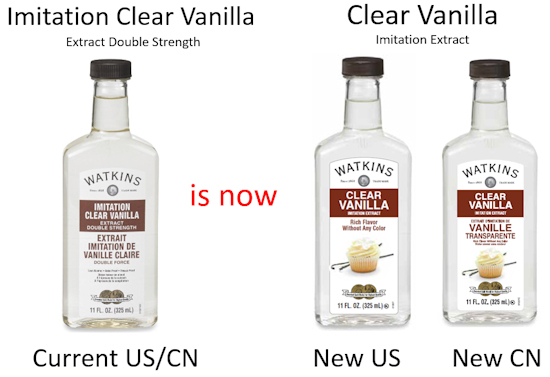 This is Watkins Original Double Strength Vanilla which has just been renamed. We hope the new name will reduce the confusion especially for people who are just being introduced to our products. This vanilla has been the baker’s favorite for over 100 years so I don’t want my current customers to be confused either! 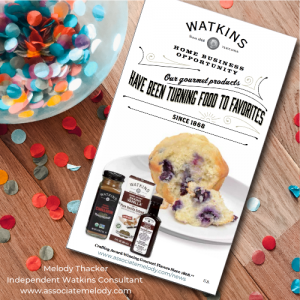 Watkins brews a pure vanilla extract then fortifies it with vanillin and other ingredients to retain the flavor even when your recipe calls for heat or freezing. This also makes it double strength so it’s more economical and you’ll save money by only using half the extract called for in most recipes. The very low alcohol content of 8-1/4%, helps make this vanilla more heat resistant. For recipes that need to be pure white such as cake, icing, meringues and whipped cream use clear vanilla. 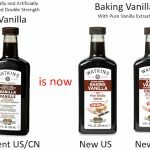 It has the same bake-proof, freeze-proof, double-strength flavor of our famous baking vanilla extract. This imitation flavor is the vanilla used for white wedding cakes. You’ll find all of these vanilla extracts here. I hope you found this helpful, if you have any questions about vanilla please don’t hesitate to ask! 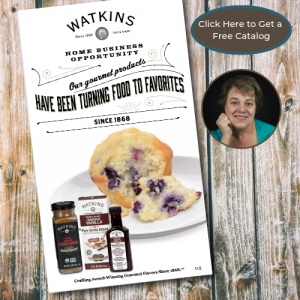 In order to be completely transparent, you should know I’m an Independent Watkins Consultant and when you purchase through my links I’ll earn a commission. Thanks in advance, your support is appreciated.